Motorcycle riders assume a great deal of risk. That risk comes from the rider him or herself, others motorcyclists or agers on the road and the environment in which a motorcyclist travels. Motorcycle Melee also offers motorcyclists a unique program that allows riders to get money back when they make online purchases. This program is called Money Back MOTO. Membership in Money Back MOTO is free and all that is required for a motorcyclists to get money back from their online purchases is to log into the Money Back MOTO site and click a store link before making an online purchase. Read more about Money Back MOTO or Join now. Contact Motorcycle Melee – ride@MotorcycleMelee.com. Rick Forristall is a web developer and aspiring writer who has been a motorcycle fan since he bought a used 1974 Honda CB 350 in 1979. He enjoyed that motorcycle until he joined the U S Air Force in 1981 and had to sell the bike (a decision he greatly regrets). Rick spent nearly 25 years in the U S Air Force in a variety of jobs including, but not limited to Administration Specialist, ICBM Launch Officer and AFROTC instructor at UMASS Lowell. He retired in 2006 and is now a Programmer Analyst at Goodwill of Central Arizona. Rick is married (to Patti since 1981), has two adult daughters and 4 amazing grand kids. After a 30-year hiatus from motorcycles, he rejoined the flock. 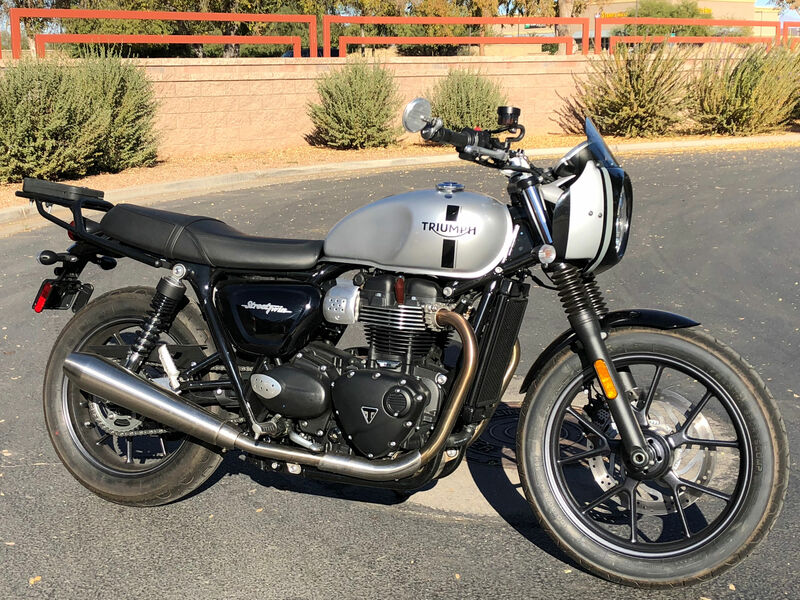 In Jul 2011 he bought a new Triumph Bonneville SE and has enjoyed riding in the awesome AZ weather nearly every day since. At one point in mid 2014 Rick thought he was done with motorcycle riding so he traded in his Bonnie for a Mini Cooper S. While the Mini is a fun ride the absence of a motorcycle in Rick’s life was challenging at best. So in October 2014 he searched for a reliable used bike and found his 2012 Yamaha FZ6R which he proceeded to convert into a Streetfighter (Read about the FZ6R Streetfighter conversion here). It didn’t take long for Rick’s wandering motorcycle eyes to land on what would become his next motorcycle. In March 2016, Rick traded the FZ6R in on a new 2015 Yamaha FZ-09 and hasn’t looked back. Now, in his early 50s, he views motorcycle riding with a safer eye than when he was a wee lad of 19 and 20. Learning to ride way back in 1979 was a painful experience. Then he had no real concept of training. This was obvious when, while trying to get that Honda to move forward, he over did the throttle and popped the clutch. The result was a sudden stop — when he crashed into his neighbor’s car. This time around he did better by enrolling in an MSF beginner rider course. He learned much about how safe riding can still be a lot of fun. After getting the Bonnie he took another class — the MSF confident rider course. In Feb 2012 he took the MSF advanced riding techniques course. Riding motorcycles is just too darned much fun to die doing it! Where did the name for this motorcycle blog from? Rick wanted to provide a forum through which he could discuss some of the peculiarities a motorcycle rider encounters and offer garage and/or home bike builders/modifiers a place to showcase their bike mods. Most will agree that there’s something unique about riding a motorcycle and, therefore; riders often experience things not experienced by non-motorcyclists. With that said, Rick wanted to ensure the site name captured the essence of the ‘ups’ and ‘downs’ a motorcycle rider faces. After a short search he came up with the word melee. Why? Well Dictionary.com defines melee as, “a noisy riotous fight or brawl.” Rick feels that riding a motorcycle often feels like a riotous fight or brawl. It seems that there are other drivers who have it in their DNA to seek out, find and make the motorcyclists’ driving experience a challenge at best. So, many times riding his bike to and from work feels like a ‘melee.’ He’s sure many other motorcycle enthusiasts understand what he’s referring to. Rick also wanted to ensure the word motorcycle was in the name in hopes that it would help anyone searching for information about motorcycles or riding find this site. So MotorcycleMelee.com was born. If you like it, please feel free to tell someone about it. Rick believes his sins condemn him to a life separated from God and he is amazed that Jesus chose to die on the cross allowing Rick to have a relationship with God–now and after he dies. He is currently working on his MA in Christian Apologetics from Biola University. hi, I would like to send you a short movie and a press kit about a new technology that allows you to dialogue with your action cam (talk’n shoot). No need to take your hands off the bars, just talk to it, it’ll answer you. we will soon start the kickstarter campaign. be very interesting to the motorcycle rider, both sports or leisure.